We're back from Ireland, and it was one of the quickest trips of my life. Maybe it was because it was just six nights (compared to some of our recent trips), but I think it was because we had so much fun. I can't wait to get back to Ireland the next time and explore some new places. I've got our photos from Ireland posted on Snapfish. Driving in Ireland was pretty much as hair-raising as advertised. I'm glad I had some experience driving on the left side of the road in Australia last year, because I felt comfortable sitting on the right side of the car and handling directions for driving on the left side. Nothing prepares you for the narrow Irish roads, though. The speed limit on most of the narrow winding roads is 60 miles per hour. Unlike the U.S. where the speed limit is merely a friendly suggestion, I believe the 60 miles per hour in Ireland is the absolute speed four wheels can stay on the pavement due to the laws of physics. At the same time, throw in the six foot high stone walls on either side that give you about an inch of leeway to play with. The walls were like bumpers installed in the gutters on a bowling alley except they didn't have quite as much give. Oh, and throw in the rogue sheep, cow, or tour bus lurking around the corner. (With sheep, cows, horses, and other animals everywhere you look, a trip in the country in Ireland is like being on a Celtic safari.) All in all, though, the car really gave us the freedom to see some of the remarkable scenery in the Connemara region in the west of Ireland. Place that lives up to the hype: The Cliffs of Moher, County Clare. The cliffs are the most-visited sight in Ireland, which means throngs of tour buses and tourists, but the scenery is absolutely spectacular. The towering cliffs, the pounding surf, and the small castle-like tower on the north side of the cliffs are really picturesque. Most overrated: The Book of Kells, Dublin. Located at Trinity College, the book is an absolute tourist magnet with little payoff. Our first day in Dublin, the book was not available for viewing because of a "technology issue." The second morning, the line to get in nearly wrapped around the building. We came back in the afternoon when the crowd was pretty light. The exhibition you go through before getting to the book is fairly interesting, but when you get to the book itself, it's pretty disappointing. Only two of the four books are shown at any one time and the books are only open to one page. However, the books are displayed together in this small climate-controlled table, so only a few people can really see it at one time. Like I said, it was pretty quiet when we were there and we still couldn't get a good look because there's too many people crowded around the book. I can't imagine when it's busy. The Old Library upstairs from the book was definitely the more awe-inspiring part of our admission ticket. Most ironic attraction: The Titanic river cruise in Belfast. The Titanic was built in the shipyards of Belfast. Biggest surprise: You always hear that Ireland has 40 shades of green, but it was the color of the water that blew me away. In some spots driving around Clew Bay and Galway Bay, the water had a turquoise blue color rivaling that of the Caribbean or the Great Barrier Reef. The color may have been the same, but the water temperature was probably a wee bit cooler. Biggest reminder of Epcot: The city of Galway. The center of the city looks like a picture-postcard Irish town. The pedestrian mall lined with pubs and shops is pure Irish, but the crowd was overly American. Every pub we went to was filled with Americans, even the Irish-speaking pubs and those on the other side of the river. Once a note of traditional Irish music was played, it was like the Pied Piper drawing in the Yanks. Best educational experience: Black Taxi Tour of Belfast. Jimmy's Taxi Service took us through the Protestant and Catholic communities at the center of the sectarian violence in Belfast. Our driver, Jimmy, showed us all the murals and important sights and gave us a real insight to the past, present, and future of these neighborhoods. A close second is the 1916 Rising Walking Tour we took through the streets of Dublin. Proof that soccer players need to toughen up: When Croke Park, the 80,000-seat stadium historically restricted to Gaelic games, opened its doors to soccer, it needed to install a heating system in the field to soften it up to the liking of the soccer players. Those playing hurling and Gaelic football had no need for such a system. Not sure if they spend as much time on the ground writhing around in pain, though. Most pleasant surprise: Getting to check-in to our room at the Jury's Inn Christchurch at 7 AM after we landed jet-lagged in Dublin. Best Irish pub: So many to choose from, but the Crown Liquor Saloon in Belfast had the most unique character. The Crown's rich Victorian interior includes exquisite details such as highly patterned tiled floors, elaborate wood carvings, and ornate mirrors. A seat in one of the 10 cozy snugs feels as if you are in a confessional booth with their painted and etched glass and wooden doors and benches. You can press a button in the snug, and an antique bell system will alert the bar staff to take your drink or food order. The Brazen Head in Dublin is the city's oldest pub and also has a lot of character. Best meal: Cayenne in Belfast. Celebrity chefs Paul and Jeanne Rankin provide an Asian fusion twist on traditional Irish staples, such as lamb, salmon, and cod. The salmon and turbot that we ordered was fantastic. Most mindblowing scenery: Doo Lough, County Mayo. We pulled over and spent only five minutes or so here, but I think I could have spent all day and not been bored. It was one of the most serene places I have ever seen. Green mountains rose above the blue lake. A road wound its way across the landscape. The hills were filled with a small group of sheep. The only sounds were the wind, the echoing of the bleating of sheep, and the random ringing of the bell around the neck of a sheep on the move. 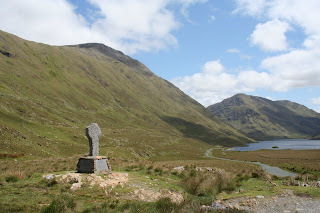 It's also a poignant place with its memorial to the Irish Famine and the numerous people who died on the road through Doo Lough trying to get help for their terrible plight. The picture can't really do it justice. Here's all you need to know about how fast Belfast is changing: the former jail and courthouse, so active during the height of the Troubles, are being redeveloped into condos, a hotel, and a casino. A church down the street from the jail is being turned into a mosque. The transformation of Belfast into a tourist destination over the past five or ten years is incredible. The highlight of our trip was a two hour Black Taxi tour through the Protestant and Catholic neighborhoods. Our driver Jimmy took us to see the wall murals depicting the struggle on both sides. After reading about the Troubles for years, it was very enlightening to go through these neighborhoods. It was a little depressing to see that the "Peace Walls" separating Protestant and Catholic neighborhoods are still being built when new homes are constructed. In Jimmy's opinion the walls will always be there. Still, the change is undeniable. Jimmy said there's no going back now. The government is actually paying the communities five thousand pounds to paint over inflammatory murals. So in a few years, many of the murals we saw may be gone. We're eager to come back to Belfast in a few years to see how the city continues to evolve. We're out in County Galway now and fly home tomorrow. This trip has just zipped by. Dublin has come and gone. I'm sure it's changed a lot in recent years. It's very multicultural. Parts of it have the feel of "Little Warsaw" since there are so many Poles. Lots of bachelor and bachelorette parties and Americans so it doesn't always have the feel of old Ireland. It has more of the feel of a very walkable London. Our highlights included a two-hour walking tour about the 1916 Rising. Got to see the General Post Office, still scarred with bullet holes. We took a tour of Croke Park, the third-largest stadium in Europe. Learned more about Gaelic sports such as hurling and Gaelic football. We did not know they were amateurs. The biggest perk for the players is the swank players lounge with free food and free beer- but only for two hours. The Book of Kells was one of those predictable sites overrun by tourists that often proves to be a disappointment (such as Changing of the Guard). Only two pages of the books are open and they are just swarmed. The old library at Trinity College, also part of the admission, is much more impressive. We did our share of pub-crawling. The Brazen Head, Dublin's oldest, was my favorite. We're up in Belfast now. I'll try to check in again in a couple days. We're flying out to Ireland tonight. Looks like we're in for typical Irish weather; we've got the sweaters, jackets, and umbrellas. The plan is to spend two nights in Dublin, two nights in Belfast, and then spend two nights around Galway in the west. Our flight lands at 5:30 AM so that's going to be an interesting jet-lag challenge, though I suspect the flight is not going to feel that bad after having done the flights to Japan and Australia. I'll try to post some blog updates from the road. It’s springtime, and Mount Auburn is in bloom. The birds have returned along with the birdwatchers. It’s hard to believe this tranquil haven is just miles from downtown Boston. What’s even harder to imagine is that this urban oasis is not a public park. It’s a cemetery. Spread over 170 acres, Mount Auburn Cemetery in Cambridge, Massachusetts, is America’s first “garden cemetery.” In contrast to the bleak, overcrowded municipal burying grounds of colonial Boston, the founders of Mount Auburn Cemetery combined horticulture, architecture, and art to create a place that is ideal for quiet reflection and contemplation. 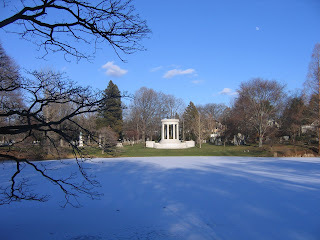 Unlike the colonial burying grounds, Mount Auburn Cemetery, open since 1831, was designed for the living as well as the dead. Natural beauty consoles the bereaved and is an affirmation of life amid the constant reminders of death. Sculptures and monuments honor the deceased, while they inspire the living. Jacob Bigelow, one of the cemetery's founders, called it "the attractive and consoling association of the garden and the grave." The grounds of Mount Auburn Cemetery, a National Historic Landmark, are covered with both natural woodlands and formal gardens. With more than 600 species of trees and thousands of shrubs, the cemetery dazzles the eyes with rich, vibrant colors in the spring, summer, and fall. Even winter provides its own quiet, desolate beauty. Grave markers range from simple, traditional slate tombstones to ornate Victorian monuments and massive mausoleums. Detailed works of art and sculpture adorn some of the family plots. Immense obelisks, Corinthian columns, and stone urns dot the rolling terrain and work in harmony with nature to give the feel of an outdoor art museum. Among the 94,000 people buried in the cemetery are governors, congressmen, actors, scientists, corporate tycoons, architects, painters, Supreme Court justices, theologians, and authors. It’s inspiring to be around such greatness. 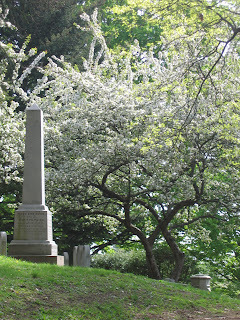 While Mount Auburn celebrates the achievements of some of America’s brightest talents, the numerous graves of young children generate melancholy thoughts of potential greatness that went unfulfilled. In the mid-1800s, children under five accounted for one-third of the burials at Mount Auburn, and gravestones marked with images such as angels, sleeping children, and broken lilies serve as poignant reminders of a harsher time. In the middle of the cemetery, a 62-foot-high granite tower built in honor of George Washington rises from the summit of Mount Auburn, rewarding those who make the short climb to the top with a commanding 360-degree panorama of Boston and its suburbs. Below, the Charles River snakes its way around the red-brick campus of Harvard University. 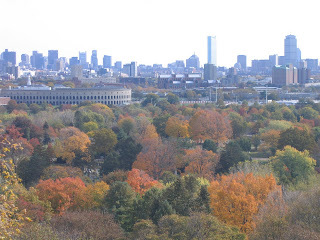 The Boston skyline soars in the distance above the treetops. (The picture underneath the HubTrotter header is from the top of the tower.) Hard to believe you're in a cemetery. Looking for a reason to go to Boston's Museum of Fine Arts, Museum of Science, or the Old State House? Well, how does free admission sound? Once again this May, Bank of America is sponsoring its Museums on Us promotion, which provides free admission to its cardholders to nearly 100 museums throughout the Northeast, Florida, and California. All this month, you can use a Bank of America ATM, check, or credit card or an MBNA credit card to get free admission for you and a guest to participating museums. Other notable New England attractions that will be free to Bank of America customers include the DeCordova Museum and Sculpture Park (Lincoln, MA); Norman Rockwell Museum (Stockbridge, MA); Portland Museum of Art (Portland, ME); and International Tennis Hall of Fame (Newport, RI). There's an impressive list of participating museums in New York City as well. For the full list of participating museums, go to the Museums on Us web site.